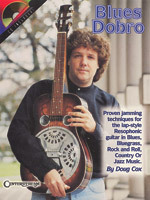 Renowned Dobro instructor Doug Cox presents proven jamming techniques for the lap-style resophonic guitar in blues, bluegrass, rock and roll, country and jazz music styles. The CD includes examples of all music taught within the book. 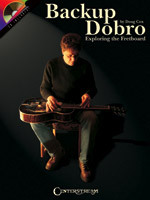 This DVD is a great primer for the beginner/intermediate guitarist interested in the techniques needed to play blues, bluegrass, country and folk guitar. 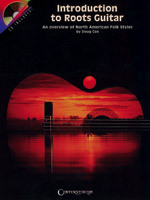 Includes tips on: tuning, hand stretching exercises, mastering basic chord progressions, forward and backward right-hand roll patterns and exercises, alternating thumb roll patterns, Travis picking, blues in E, right-hand muting, right-hand frailing or brush strokes, string bending, 4-finger roll patterns, right-hand string grabbing and more. You'll learn the basic techniques needed to be a roots guitar player, and identify those techniques while learning from other players with this fun, detailed DVD. Booklet included; approximately 60 minutes. Take a private lesson with Doug Cox! There's no better way to start from scratch on this expressive instrument than with this master instructor. Teaches notes and major chords; common I, IV, V chord progressions in all keys; chucking (back-up playing); tone and damping tips; and easy versions of the songs: The Water Is Wide, Worried Man Blues, St. Anne's Reel. Includes a transcription booklet. 60 minutes.